Earlier this year, I pulled the boys out of their Spanish class at the local school to homeschool Spanish, and immediately felt overwhelmed. I know I am capable of teaching Spanish at home, but I really had no idea as to where to start. I spent hours searching online for the best curriculum to use at home, and finally settled on Risas y Sonrisas: Spanish for Kids. I am so thrilled to review this program for you guys today because it’s given me so much confidence in my ability to teach elementary Spanish at home. What is Risas y Sonrisas? 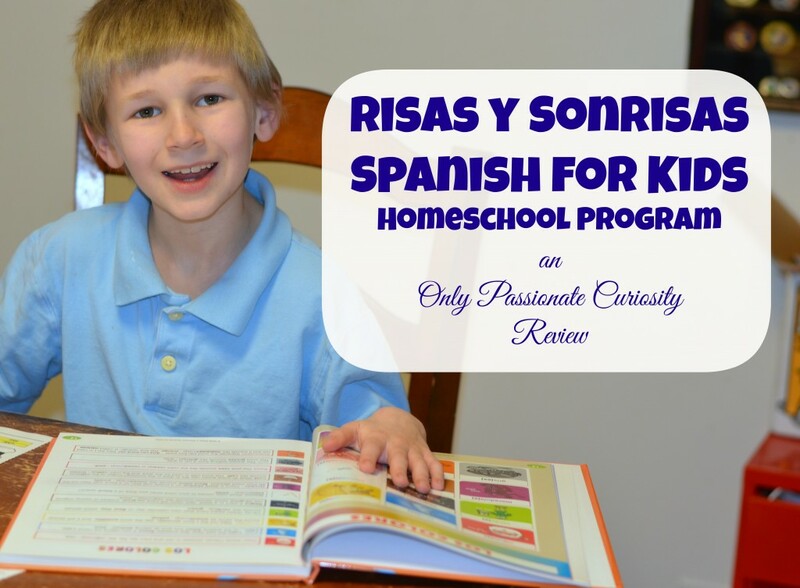 Risas y Sonrisas Spanish for Kids is a homeschool Spanish program intended for kids in grades K-5. It’s a truly multi-sensory program, incorporating everything from textbook reading and worksheets, to singing songs, learning sign language along with Spanish, acting out skits, and playing games. It is easy to use with multiple grade levels at once, and focuses on pronunciation and communication rather than grammar. Cultural awareness, English cognates, and reading skills are also taught. This program includes 80 lessons written for students in grades 3-5, meant to be done in 4 semesters of Spanish classes meeting twice a week for an hour. Younger students would focus mainly on learning the songs, sign language, playing games, and simple phrases with adaptation by the parent. The Student Book, Interactive CD, and Skits DVD: The student book is a gorgeous, full color textbook with picture guided vocabulary, lyrics to the songs, questions and answers, and scripts for the skits. For older students, this book will be the backbone to your program. You will use it to guide lessons, and to follow along with the skits and songs. The interactive CD has the vocabulary, verb conjugations, song lyrics and question and answer sections. This is SO helpful for parents who are not fluent in Spanish, and for kids to independently practice their vocabulary. The skits show children having basic conversations using the questions and answers, as well as previously covered vocabulary. Scripts are included in the textbook which helps kids follow along, and then they can act out the skits on their own for conversation practice. Activity Workbooks: The program comes with 4 paper workbooks to use along with the text. You will need one set per student, so make sure you order enough for all your children! They include multiple worksheets for each set of vocabulary, so your kids can practice the words in many different ways. Some require reading, others practice writing, and even spelling. 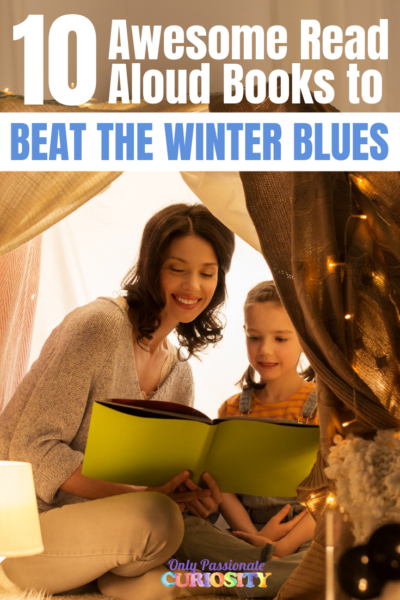 Pages are perforated so you can easily remove them and give your child one at a time. Music CD and Song Lyrics Booklet: The vocabulary is presented in simple songs which help kids memorize the words, and master the pronunciation. The songs are basic, but effective! Flashcard/Domino Set: These cards are printed on heavy duty card-stock in full color, and are perforated for easy separation. Game instructions are included in the teachers manual. The games are especially helpful with younger students, and makes review much more fun! Cognate Picture Card Set with Folder and Audio CD: This may be my favorite part of the program. It includes many cognates which are Spanish words that are similar to English words. They are huge confidence builders for young students, and have helped us expand out Spanish vocabulary quickly. The Audio CD speaks all of the words, so you will learn pronunciation quickly. 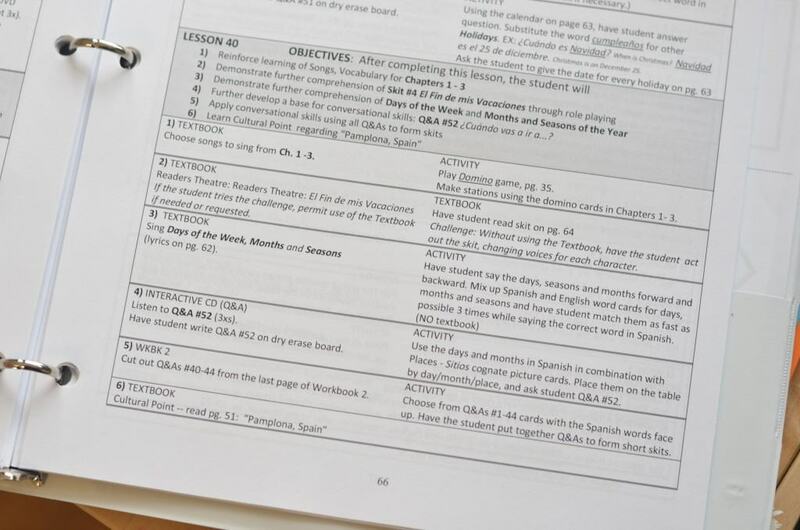 The Teachers Manual: The final element included in the Homeschool Spanish Program is the teachers manual, which is black and white, sent hole punched in a binder. It opens with an explanation of how the program works, and how to set it up. It then gives the teacher a quick crash course on pronunciation, and goes unit by unit over the verb conjugations and pronunciation details the teacher will need to be successful. It then gives instructions for each of the games played in the program, and has an overview of what is covered in each chapter. Next, the teachers manual goes into lesson plans, the blackline masters, and answer keys. Lesson plans are concise, and simply give a short list of things to accomplish, with their coordinating page numbers if the assignment is in the textbook or workbook, or a track number if the assignment is a song on a CD. Each lesson contains about an hour worth of material. You’ll read something in the textbook, using the audio CD to ensure correct pronunciation. You will watch a video on the sign language DVD to aid in memorization of the vocabulary, and sing the vocabulary songs. Each lesson includes helpful conversational questions and answers, which are easily used as stepping stones for further conversation. You will play games, and complete the associated worksheets to give additional reading and writing practice. Risas y Sonrisas is not, however, open and go. 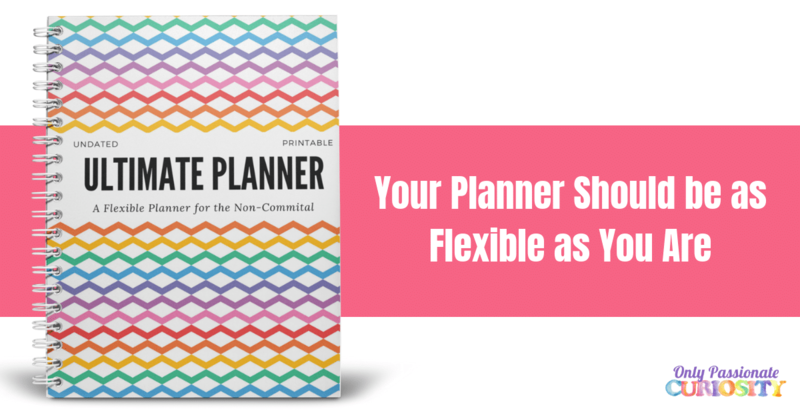 When you purchase this program, plan on needing a week or so to really sit down with the materials, organize them in a way that makes sense to you, and figure out how to teach them. There is a ton here, and it does take a little time to learn how to use it effectively. The teachers manual has a lot of information in it. 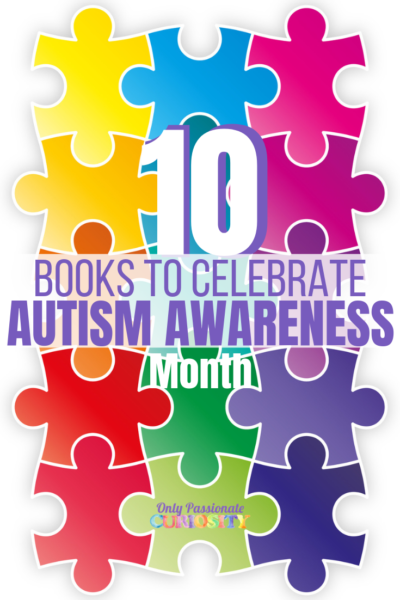 The lesson plans outline what to do, but the pronunciation information, directions for the games, and other materials are spread out in the various books, CDs and DVDs. Risas y Sonrisas takes me about 30 minutes a week in planning to read the lesson plan, and then look up instructions for the games, teach myself the pronunciation, sticky note pages in the various books, and outline what to do, and how to do it in my notes. A teacher who already speaks Spanish, or something with less OCD tendencies than I have (because I admit to being fully type A and need my materials to be organized just so before I can dig in) may not need as much preparation time. Once I got a handle on how the program worked, and became familiar with what resources were where– we all loved it. I do assume that as time goes on, and I teach it more and more, there will be less preparation time needed for me to be comfortable teaching. The kids are having a wonderful time with the sign language songs to learn Spanish. The printed materials are all very high quality, and the program feels worth every penny. You get a lot of bang for your buck here- between the skits, and the interactive elements, and the games, and the colorful books and thoughtful worksheets- you’ve got something full and complete and just wonderful. Bug and Mr. Man have two very different learning types, and I am so pleased at how well they both do with it because of the varied activities. It’s been easy combining them in lessons too! They are in the First and Third grades, and work very well together with Risas y Sonrisas. Mr. Man doesn’t read out of the textbook or do the workbook pages, but he sings the songs with us, watches the skits, is learning the sign language along with his Spanish, and plays all the games. He is capable of holding basic conversations and participates in the question and answer activities. As of right now, we are moving at a pace of about one lesson per week, and it should take us about 2-3 years to get through the materials. The Risas y Sonrisas Homeschool Spanish Program costs $175. 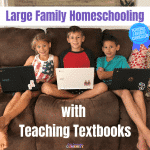 Screenshots used in this review are from the Online Resources which is an additional $60 per year for one homeschooled student. A note on the Online Resources: The online resources are largely composed of the songs, videos, and materials present in the other materials shown in this review. I chose to use screenshots from this program because they were the easiest way to give you a clear idea of the materials and quality from the other CD and DVD sets. If you buy the Homeschool Program, most of the contents of the online program are included on the CDs and DVDs in the program. The other purchasing option would be to order the printed materials separately, and use the media on the website subscription (or, get the whole shebang- which is what I would suggest for tutors and classroom teachers). The online resources subscription does make the multi-media materials easy to use because everything is in one place and you do not have to shuffle between the various computer disks, DVDs and CDs. All materials are presented in order of unit, so it’s all organized and ready to go (the CDrom is organized by type of material- songs, vocab- and not by unit). The domino card games also self-check on the computer, which is nice for independent play. Overall, for parents teaching this program to only their children at home, the only resource I saw that was not available in the homeschool kit that is on the online resources is a fun vocabulary bubble game (Bubble Breakdown from Longshot Games), which you can purchase on the iPad for free, and access all the units with a $9.99 in app purchase. 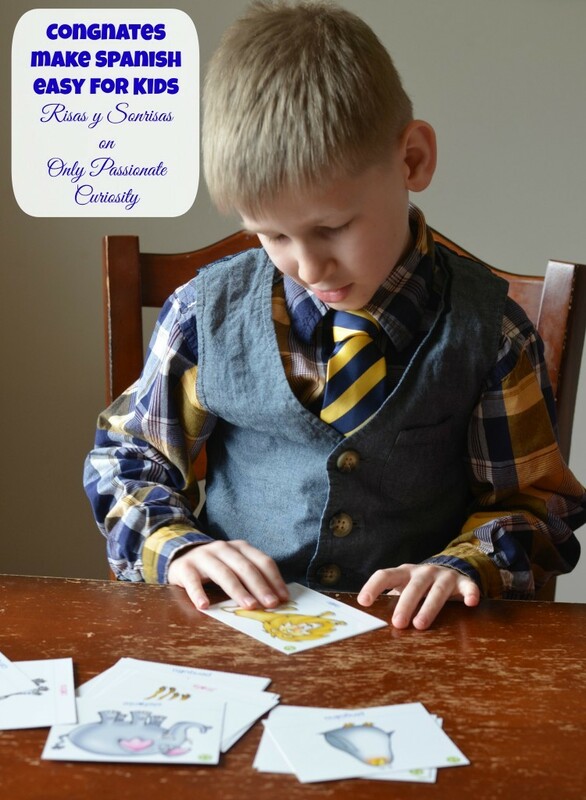 If you like games, Risas y Sonrisas has a new, complementary bingo card set that allows for 5 children to play (and practice their vocabulary) in a fun way. This is a very well done program that works for combining multiple grade levels together to teach Spanish at home. It is recommended for kids in K-5th grades, with the written lessons focused on 3-5th grades. Lessons are meant to be done in just a couple hours a week, and the program takes 1-4 years to complete depending on how much time you decide to dedicate to Spanish. Lessons do require a high level of parent/teacher involvement, and take a fair amount of teacher preparation. It is appropriate for both fluent and non-fluent teachers, because it comes audio and video support to ensure proper pronunciation. This is a true multi-sensory program, combining reading, speaking and listening skills, with songs, skits, sign language and games. Online Support is available, and is supplementary, not required. This is a FUN and effective program, and I highly recommend it. I am thrilled to join with Spanish for Kids to offer a giveaway of a one year license to the online Spanish resources for Risas y Sonrisas. If you plan on using the program, this will be a huge help to you! 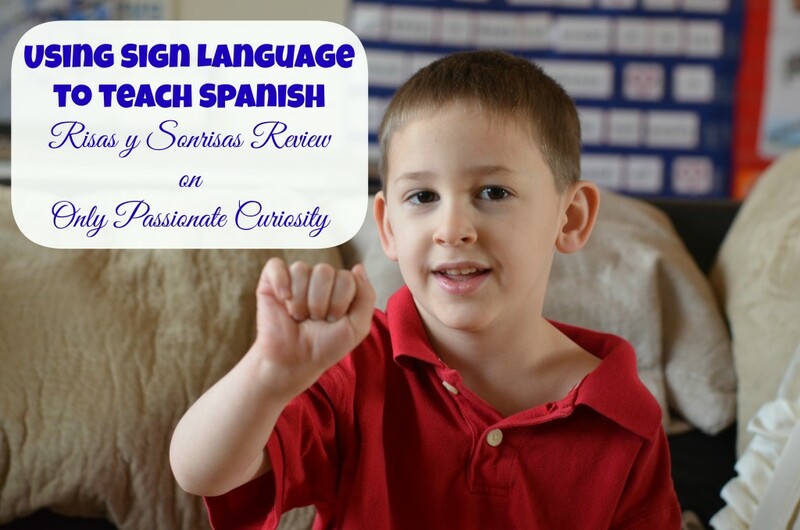 Even if you don’t plan on teaching the full Risas y Sonrisas program, this will give your kids amazing exposure to Spanish vocabulary and conversation (and give you a sneak peek into the quality and content of this awesome program). Enter to win using the rafflecopter form below. All entries will be verified. We are considering HS this fall and I wanted to add a foreign language thanks for the helpful info! Every day! Our 6 year old was born in Guatemala! We are learning some spanish from spanish speaking family and are looking for a good curriculum. Thanks for the review this sounds like it would meet our needs. We did sign language and Spanish when our child was a baby/toddler. We moved to Germany and started taking lesson for German. We joined a homeschooling group that teaches Spanish once a week. We’d loved to get back into a more enriching program. We do Latin in our home but Spanish would be a welcome addition. Thanks for the great review and giveaway! I’ve tried teaching Spanish off and on, but its been hard to stick with. I learned Spanish in high school and really want to teach it to our children since we have Hispanic relatives. So no, I haven’t taught it yet in our home but I would very much like to! I don’t teach a foreign language yet. I have been wanting to incorporate it as part of our learning. This is so neat! No, we are not doing language yet because my daughter doesn’t know what language she wants to learn. Yay! I have been looking for a good Spanish program. As I am a non-Spanish speaker, I am always looking for something thorough, but simple. Thanks for the review! I am starting to teach Spanish at home. I am having a hard time trying to figure out where to start. We are working on Spanish with a couple different resources. I plan to add in Latin next year! It will be busy!! I would love to have something that would provide a structure for teaching Spanish. Unfortunately my oldest is in kindergarten so i don’t know if this program would work for her. Have you found anything for a younger age group? I want to teach Spanish, but it is always the first thing to get dropped. I would love something to help me along!